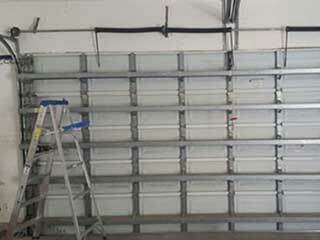 Home Our Garage Door Services Garage Door Maintenance How Should I Look After My Garage Door? We advise against trying to fix your door yourself when something significant breaks. The door contains various complicated mechanical parts and it's easy to cause further damage if you are untrained in this area. However there is nothing to stop you from taking care of your system and its various components in other ways. If you're planning a general clean-up of your home, don't forget to include your garage door in this routine. The door can be cleaned with plain soap and water with a soft sponge, and a general vacuum or sweep up may help to remove dirt and elements underneath the door. Leaves or rocks may cause problems for the door's operation and dirty sensors can render the eyes unable to detect obstructions in the path of the door potentially causing a significant safety hazard. Lubricating your garage door parts is a rather easy task as long as you ensure you get the right lubricant for your system. Parts that can be lubricated include the cables, tracks rollers and springs. Regularly apply lubricant should help to prevent rust from taking hold and spreading in the future. Take notice of the warning signs that something is wrong with your door. If you you’re your door is becoming noisier, looks a bit wonky or appears to have a life of its own (by closing and opening without you telling it to), these are all signs that you should have the system inspected by a professional. In order to ensure your door stays healthy for longer it's important to know when to call in an expert. If you notice significant wear on the springs or think the opener might need its motor replacing, these are not things you should try and attempt yourself for risk of causing further problems. Our experts at Garage Door Repair Rancho Cordova are only a phone call away.